Downtown Detroit, 2016 | ride. travel. live. A brief business trip brought me back to Detroit for the first time in a couple of years. While a wide swath of the city is rapidly disappearing, the high density stretch downtown to Midtown is regaining some of the hustle and bustle of years past. I don’t think the city will ever reach its postwar peak of 1.8 million again, but downtown is pretty stable, the demolitions have stopped, and work is underway on the new arena in anticipation of the move of the Red Wings and the return of the Pistons. I happened upon one of the free tours of the glorious art deco Guardian Building, which offers a detailed look at the jazzy, exuberant exterior and then takes in the view from the top floor, a rare view of Detroit from above that most visitors miss. Even with the unfortunate demolitions of numerous buildings starting in the 1970s, it’s a rich collection of early skyscrapers which thankfully won’t be going anywhere anytime soon. There’s lots of buzz downtown, with renovations, adaptive reuse, and residential conversions. 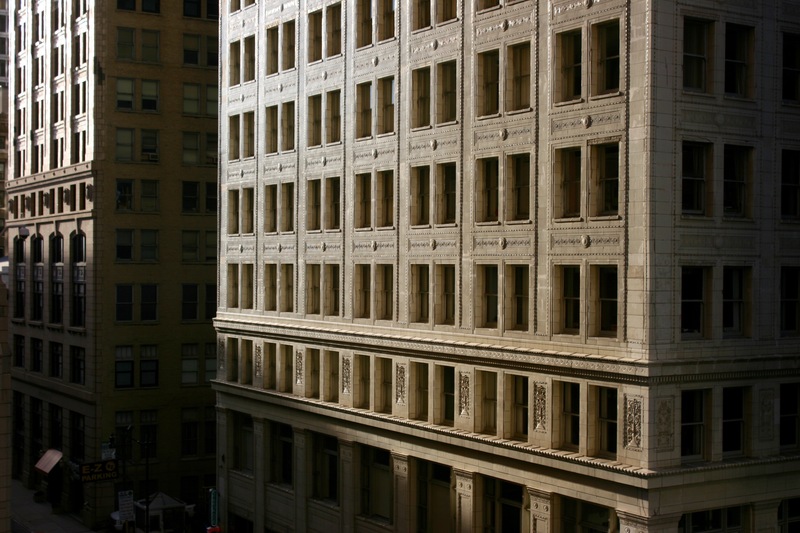 The pre-Depression era skyscrapers are outstanding, mixed in with high quality mid-century designs that have stood the test of time. The skyline has changed little in 50 years, and here’s a few pictures of the blocks around the Guardian Building. 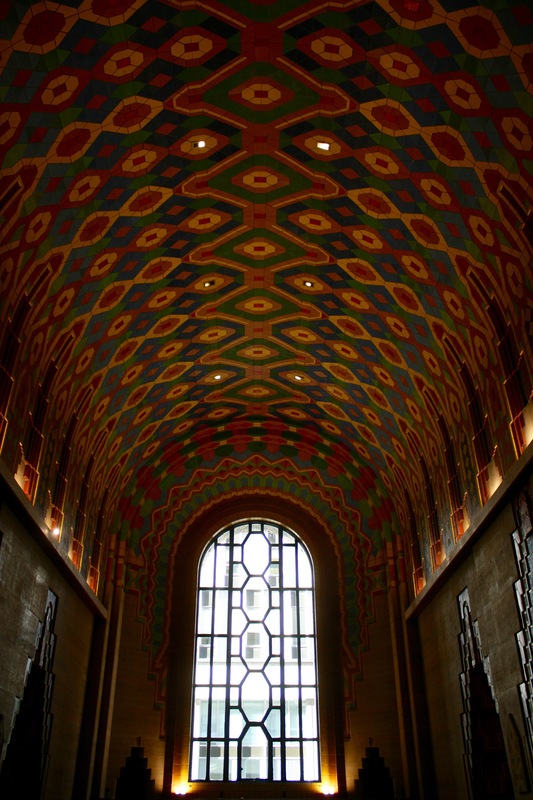 The vaulted lobby of the Guardian Building (Wirt Rowland, 1929), decorated with Pewabic tile. 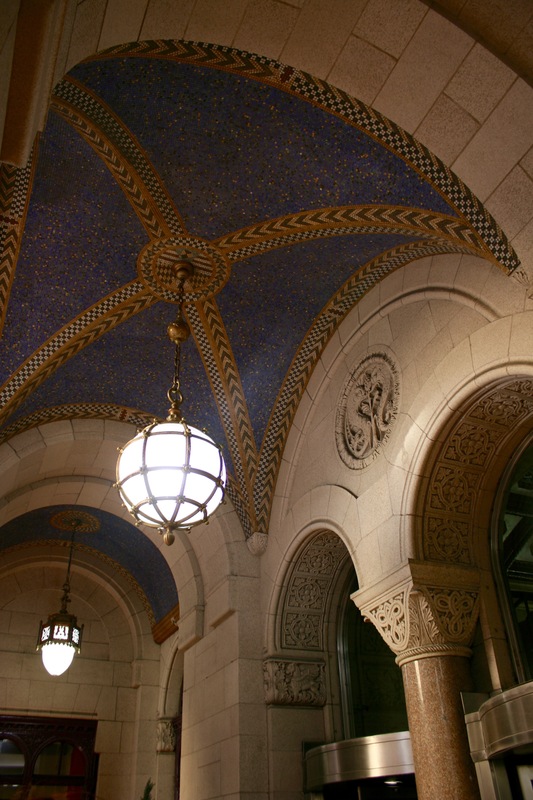 It’s hard to imagine that this lobby once featured a dropped ceiling that hid all of this tilework, before a 2003 renovation set things right! 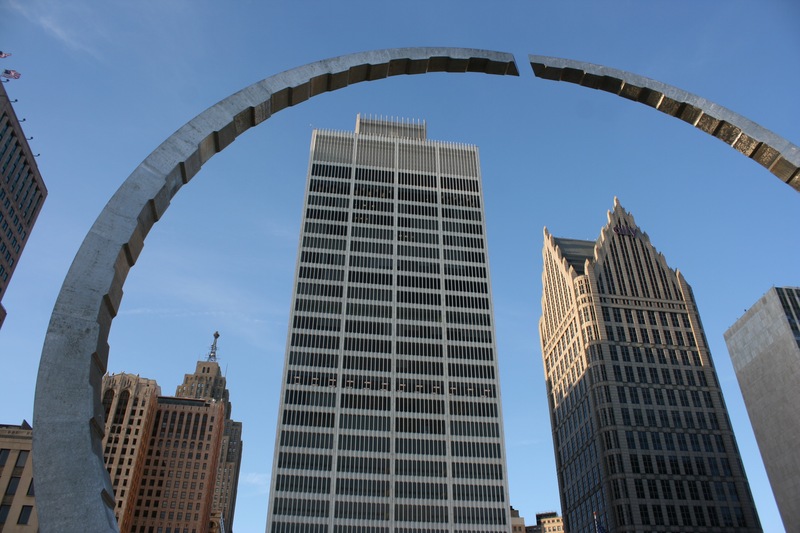 And from Hart Plaza, Minoru Yamasaki’s elegant One Woodward (1963), and Johnson and Burgee’s postmodern One Detroit Center (1992), framed by the sculpture Transcending (2003). The Romanesque entryway of the Buhl Building (Wirt Rowland, 1925). Yup, same designer as the Guardian across the street, completely different style.